It’s also full of ingenious extras that make working on the go much easier, such as WiFi connectivity and an NFC reader. Sleek and robust, this is a productive and easy to use printer. Print, copy, scan and fax - all up to A3. Part Number: MFCJ6930DWZU1. Brother MFC-J6930DW A3 Colour Multifunction Inkjet Printer. The Printer Broker Ltd is a supplier of printers, fusers and printer parts based in Bolton, Greater Manchester, UK. 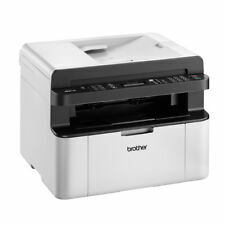 BROTHER MFC-J6930DW All-In-One Colour Inkjet Multi Function Printer, Copier, Scanner, Fax, WiFi, Network, USB 2.0. It’s also full of ingenious extras that make working on the go much easier, such as WiFi connectivity and an NFC reader. 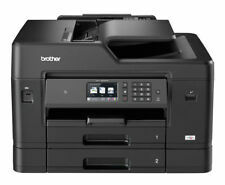 Brother MFC-J6935DW multi function printer A3 A4 A5 22PMM PRINT/CPY/SCN. Supported AirPrint, Google Cloud Print, iPrint&Scan, Mopria, Brother Print Service Plug in for Android. Max paper size A3. Paper output 100 (Up to A4) / 50 (Over A4). It’s also full of ingenious extras that make working on the go much easier, such as WiFi connectivity and an NFC reader. Sleek and robust, this is a productive and easy to use printer. Print/copy/scan/fax - all up to A3. It's also full of ingenious extras that make working on the go much easier, such as WiFi connectivity and an NFC reader. Copy Color: Colour. Multifunction Devices: Copier/Fax/Printer/Scanner. Fax Color: Colour. USB 2.0, Parallel & Ethernet connections. Print, Copy, Scan and Fax functions. Print up to 20ppm. Add to Favourites. We will always go out of our way to source the product you are looking for. A3 wireless network ready multifunction fax copier printer & colour scanner. It’s also full of ingenious extras that make working on the go much easier, such as WiFi connectivity and an NFC reader. USB cable not supplied . Brother MFC-J6930DW (A3) All-in-One Colour Inkjet Printer (Print/Copy/Scan/Fax) 265MB 9.3cm Colour LCD 22ipm (Mono) 20ipm (Colour). Stand out with professional marketing materials and vivid office handouts. The Brother MFC-1910W is stylishly designed and compact enough to fit onto a shelf or workstation. It produces outputs with the speed and quality you would expect from a more expensive machine. Wireless ready. A3 printing. Print, copy, scan and fax with the versatile MFC-J6930DW from Brother. We partner with worldwide carriers to ensure you receive the best possible service. 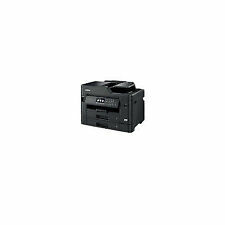 MFCJ6930DWZU1 Brother MFC-J6930DW MFP 4800 X 1200DPI A4/A5 22PMM PRINT/CPY/SCN :: MFCJ6930DWZU1 (Printers > Multifunction Printers). MFC-J6930DW inktjet A3 MFP 35/27ppm print copy scan fax ADF 1200x4800 dpi 256MB USB 2.0 NFC LAN WLAN 9 3CM LCD touchscreen. MFC-J6930DW inktjet A3 MFP 35/27ppm print copy scan fax ADF 1200x4800 dpi 256MB USB 2.0 NFC LAN WLAN 9 3CM LCD touchscreen. Print speed (colour, normal quality, A4/US Letter) 27 ppm. Print speed (black, normal quality, A4/US Letter) 35 ppm. Print speed (black, normal quality, A4/US Letter) 20 ppm. Maximum resolution 2400 x 600 DPI. Maximum copy resolution 600 x 600 DPI. Optical scanning resolution 600 x 1200 DPI. Maximum scan resolution 19200 x 19200 DPI. Multifunction Printers. Laser Printers. Inkjet and Photo Printers. Dot Matrix Printers. Faxing: Mono. Copying: Mono. Printing: Mono. Print technology: Laser. Model: MFC1910WZU1. Manufacturer's SKU MFC1910WZU1. Scanning type: Flatbed. Scanning technology: Dual CIS _: Dual CIS. Optical scanning resolution: 1200 x 1200 DPI _: 1200 x 1200 DPI. Scanning depth of output color: 24 bit _: 24 bit. Scanning depth of incoming color: 48 bit _: 48 bit. Brother MFC-1910W 2400 x 600DPI Laser A4 20ppm Wi-Fi multifunctional. 4.5 out of 5 stars - Brother MFC-1910W 2400 x 600DPI Laser A4 20ppm Wi-Fi multifunctional. 5 product ratings5 product ratings - Brother MFC-1910W 2400 x 600DPI Laser A4 20ppm Wi-Fi multifunctional. It's also full of ingenious extras that make working on the go much easier, such as WiFi connectivity and an NFC reader.Key Features Print, copy, scan and fax - all up to A3. Product Series: MFC. Up to 22ipm mono / 20ipm colour print speeds. Product Type: Multifunction Inkjet Printer. Stand out with professional marketing materials and vivid office handouts. Product Type Multifunction Inkjet Printer. Scan to popular cloud storage facilities directly from the large 9.3cm intuitive swipe touchscreen. The integrated scanner produces high resolution images up to 600 x 1,200 dpi, and it can print and copy at speeds up to 20ppm. Built-in Wi-Fi enables wireless access from your smartphone or tablet as well. Print, copy, scan and fax with the versatile MFC-J6930DW from Brother. During that process you will be issued with an RMA number. 9.3cm Touchscreen LCD. Automatic 2 sided print, copy, scan and fax. A3 printing. Series: MFC J 6930 DW. Brother MFC-J6930DW Colour Inkjet Printer | A3 | Print, Copy, Scan, Fax & Wireless | 2 Paper Trays. Scan to popular cloud storage facilities directly from the large 9.3cm intuitive swipe touchscreen. Brother MFC-J6930DW multifunctional Inkjet 35 ppm 1200 x 4800 DPI A3 Wi-Fi. MFC-J6930DW inktjet A3 MFP. Highlights MFC-J6930DW inktjet A3 MFP 35/27ppm print copy scan fax ADF 1200x4800 dpi 256MB USB 2.0 NFC LAN WLAN 9 3CM LCD touchscreen. 20PPM 32MB PRNT/CPY/SCN IN. Brother MFC-1910W multifunctional Laser 20 ppm 2400 x 600 DPI A4 Wi-Fi. Maximum resolution 2400 x 600 DPI. Maximum copy resolution 600 x 600 DPI. Optical scanning resolution 600 x 1200 DPI.